Washington, D.C.: US President Donald Trump will meet for the second time with North Korean leader Kim Jong-un around the end of February, the White House said on Friday, after a top general from Pyongyang paid a rare visit to Washington. Vice-chairman Kim Yong-chol, a right-hand man to the North Korean strongman, met the embattled president at the White House for an unusually long 90 minutes as the countries seek a denuclearisation accord that could ease decades of hostility. White House spokeswoman Sarah Sanders said that Trump — who has opined that he and Kim Jong-un fell “in love” after last year’s landmark first summit — would again meet the North Korean leader “near the end of February” at a location to be announced later. The latest flurry of diplomacy comes little more than a year after Trump was threatening to wipe North Korea off the map, with Pyongyang’s nuclear and missile tests rattling nerves in East Asia. Sanders praised North Korea’s efforts to reconcile but ruled out, for now, a key demand of Pyongyang — a lifting of sanctions. “The United States is going to continue to keep pressure and sanctions on North Korea until we see fully and verified denuclearisation,” Sanders told reporters. “We’ve had very good steps in good faith from the North Koreans in releasing the hostages and other moves and so we’ll continue those conversations,” she said. She was referring to Pyongyang’s quick deportation last year of an American. In 2017, a US student returned home comatose from North Korea and died within days after what a US judge said was torture. Critics say that the Singapore summit was little more than a photo-op. The second round with the young and elusive North Korean leader will again offer a change of headlines for Trump amid a steady barrage of negative reports, including explosive allegations published Thursday by BuzzFeed that he pressured his lawyer to lie to Congress about a project in Russia. “Let’s hope the second summit produces real results, but don’t hold your breath as we wait for episode two of the Trump-Kim show,” said Michael Fuchs, a senior fellow at the left-leaning Centre for American Progress who worked closely with former secretary of state Hillary Clinton. Abe Denmark, director of the Asia program at the Woodrow Wilson International Centre for Scholars, said the Singapore summit weakened the security of US allies with little in return. “With another summit in the making, I hope for tangible progress and fear for a repeat: little movement from Kim, major concessions from Trump,” he said. But Trump has pointed to the halt in missile launches by North Korea and recently said there would have been “a nice big fat war in Asia” if it were not for his efforts. Kim Yong-chol is the first North Korean dignitary in nearly two decades to spend the night in Washington, staying at a fashionable hotel a short drive from the White House. Secretary of State Mike Pompeo welcomed Kim at the hotel, posing briefly for pictures near a shelf with a framed portrait of civil rights icon Martin Luther King Jr., and later invited the delegation to lunch. The State Department said that Stephen Biegun, the US special representative on North Korea, would carry on discussions at a conference in Sweden starting on Saturday that will involve Pyongyang officials. While no decision has been made on location, a Vietnamese government source told AFP that “logistical preparations” were under way to host the summit, most likely in the capital Hanoi or coastal city of Danang. Vietnam’s cooperation with the United States has been growing for years as Hanoi — much unlike Pyongyang — sets aside memories of war. US-North Korea tensions began to abate a year ago with the encouragement of South Korea’s dovish president, Moon Jae-in. The Singapore summit marked the first-ever meeting between sitting leaders of the United States and North Korea, which never formally ended the 1950-53 Korean War. For Kim, whose family has ruled North Korea with an iron fist for three generations, the stakes are existential as he seeks guarantees of the survival of his regime. The United States expects Pyongyang to give up its nuclear arsenal, doggedly built by the Kim dynasty despite sanctions and famines. 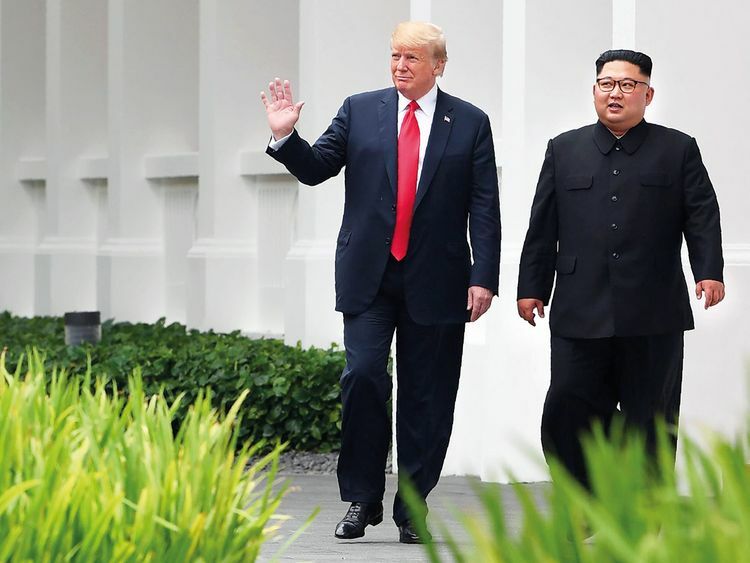 But North Korea sees the denuclearisation goal more broadly, seeking an end to what it sees as US threats as well as strict sanctions on its economy.